Air Conditioning in all Bedrooms Portable fan and heater available if needed for other areas. Air-Conditioners have heating function. Portable Heater available if needed too. 2 log fire places. Fireplaces in Lounge/ dinner and bedroom #5. Secure Parking on our private land. Covered Car Port in our private land. Large snooker/ pool table on garden terrace. Traditional Local Shops nearby by foot. Carrefour Supermarket ~15 minute drive. Our accommodation is self-catering but we can assist with any special requests, including for example, providing a cook on-site, a driver, tour guide, house-keeping / porter (please let us know your requirements). Airport transfers provided. Daily trips to central town/ other destinations can be arranged for a reasonable fee. Nous rentrons d'un magnifique week-end dans la villa Tigmi Mouzoun où nous avons séjourné 4 jours 3 nuits. Nous avons été accueilli à l'aéroport par Abdel Ali, point de départ d'un week-end de détente totale! Abdel Ali et Taieb sont super sympathiques, à l'écoute, très réactifs et serviables. Nous avons été très agréablement surpris par toutes les attentions portées envers leurs hôtes. Merci à eux!!! Le tout est propre et en bon état! En conclusion nous avons adoré et prévoyons déjà d'y retourner l'année prochaine! My friends and I loved our stay at the villa. We all spent a marvellous time relaxing in the olive grove, swimming in the pool, sunbathing in the secluded courtyard and stargazing from the roof terrace. We were greeted so warmly when we arrived and looked after very well while we were there by Abdelali and the gardener, who brought us fresh herbs from the garden to cook with, and honey and olive oil and pots of tea made with fresh mint. We also loved to see the baby goats in the garden. We were all planning our return visit before we had even left! And hopefully for longer next time. Thank you all for your hospitality and sharing your beautiful house. Stunning, peaceful and truly beautiful..
Definitely exceeded our expectations. Pictures do not do this property justice! Location was ideal. Abdel ali and the team were extremely hospitable. Hopefully see them for another stay in the near future Inshallah! We had such a great time in this villa. 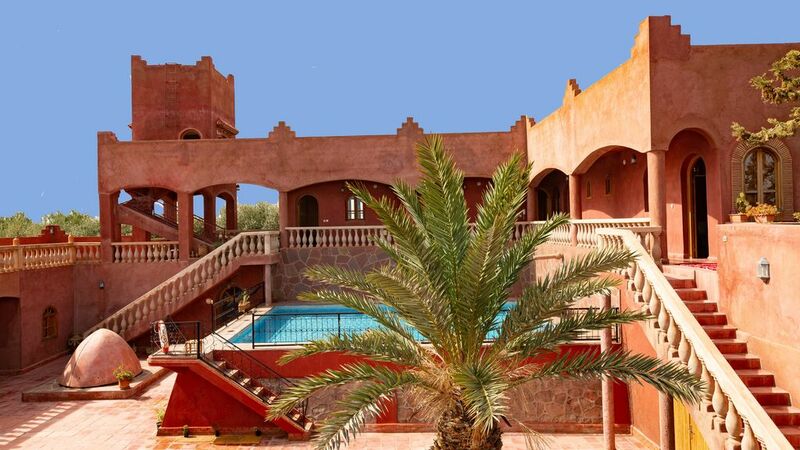 Firstly we would like to thank the owners they were so helpful and particularly Ali who took us around Morocco for our stay and was always at hand to help us if we had any queries. The villa was nice and clean with traditional decor and artwork throughout. The main reason I chose this villa was the facilities like Sauna/steam, hot tub and the secluded pool all to ourselves, it was well worth the money. There was so much room the kids had a great time running about on each floor. Also there were some toys and games and the kids loved the PlayStation. 2 towels were provided in each room all of which had new bedding and duck down duvets. There was a new washing machine and fridge. Kitchen was large with lots of pots and pans to cook. Complimentary lunch upon arrival in the traditional tagine was superb. Ali even gave us a tagine to take home. (made it home on 1 piece). We would definitely return again. Photos don't do it justice. La villa è davvero molto grande, con grandi spazi aperti molto piacevoli. Le camere sono belle curate ed hanno tutto il necessario, cucina e salotto sono non troppo grandi ma molto accoglienti.Il bagno in cortile con vasca, sauna e jacuzzi ha reso la nostra vacanza ancora più rilassante. il prato all'esterno è enorme, molto molto bello sia per grandi che per bambini. Le persone che hanno assistito il nostro soggiorno sono molto gentili e premurose, l'ospitalità è davvero davvero molto bella. Da tenere in considerazione la distanza dalla città. Payment of a deposit within 5 days of first making your enquiry. We accommodate families, couples and children. Sorry No stag groups.